What if? was a simple two-word question that once was a comic series published by Marvel. Such stories were told as What if Jane Foster Found the Hammer of Thor?…wait, that happened, or What if the Alien Costume had Possessed Spider-Man?. What if? is perhaps the best way to start talking about Spider-Man 2 on the PSP. An almost more applicable title for this game would be What if Activision kept producing linear Spider-Man games?. I guess that’s much more of a mouthful than simply Spider-Man 2 but the summary is very applicable. If you’re looking for a portable, open-world Spider-Man game, this is a game that will end up disappointing you, but if you enjoyed the PSOne Spider-Man games and the first movie title released in 2002, this is very much a game that’s worth your time. That being said however, Spider-Man 2 on the PSP doesn’t exactly fix the problems of its pre-open-world siblings, and the device in which it is on creates brand new ones. Like every other Spider-Man 2 game across countless consoles and handhelds, the PSP SKU uses the basic template of the film of the same name: Peter Parker struggling to manage his responsibilities and relationships with his web-slinging antics as a new villain, Doctor Octopus, rises to terrorize New York. The title villain is less a tragic figure here, going as far to enlist the aid of other classic Spider-Man villains like Vulture, Rhino, Shocker and Mysterio who make up the rest of expanded roster of bad guys. Story wise you’re not going to get the rich, emotional character drama of the film but it’s a serviceable one for the sake of the game made authentic by having most of the cast from the film, save James Franco, record new dialogue for cut-scenes exclusive to the PSP. Almost worth it for the price of the game alone is that J.K Simmons voices J. Jonah Jameson which wasn’t the case for the console game. Whereas the other Spider-Man 2 portable games on the Nintendo DS and Game Boy Advance were strictly 2-D games with some limited 3-D effects thrown in, the PSP game is fully 3-D. As mentioned above, Spider-Man 2 on PSP shares more in common with Spider-Man (2002) than its 2004 sequel, even going as far to use the same Spider-Man character model, sound effects (when enemies die), music (some levels and the finishing and failing themes from Spider-Man (2002), and even one whole level towards the end game which is ripped directly from an early level in Spider-Man (2002). For those unfamiliar with pre-Spider-Man 2 games, this basically means the game is made up a series of levels instead of an open-world, mixing interior and outdoor environments. Given that this was an early PSP, as in it launched alongside the system, it was a wise decision to stick to a stricter, linear based game rather than try to scale down the console Spider-Man 2 experience and more than likely have it fail to live up to expectations. The missions that make up the campaign never take longer than ten minutes or so to beat, making them ideal for quick pick-up-and-play portable game sessions whether you were playing it back then or even now. Similar to the two pre-movie games and the first movie tie-in, this also means that Spider-Man 2 is also not particularly long, however there is at least some replay value to be found in playing on higher difficulties, and trying to your stage scores which translate into currency to buy new moves and upgrades. Activision’s first console Spider-Man was a brilliant way to bring the hero into the modern age of three-dimensional video games, allowing the player to fight bad guys, stick to walls and swing on webs. As fun as it was to do these things though, issues with camera, particularly in interior levels, and clunky combat persisted all the way up until Spider-Man (2002) and sadly those issues keep this version of Spider-Man 2 as a good game instead of a great one. You can purchase new moves for example within an in-game store and mix punches and kicks, but mashing on either the punch or kick buttons will do just fine. I went through the entire game exclusively purchasing upgrades to my health, attack power, and ability to recharge my web faster and it’s a sound strategy for those who decide to invest into this game if you’ve never played it before. Spider-Man 2 on consoles was best when you were given the freedom to swing on webs outdoors and that also goes for this game, but unfortunately exterior levels are the exception. The majority of the stages take place within buildings like warehouses, banks, and a museum given some twisted touches by Mysterio, and while all are decently constructed and not terribly difficult to navigate, things never feel quite as good as what they could be. This is the fault of the camera, but also the PSP hardware itself and not exclusive to Spider-Man 2. 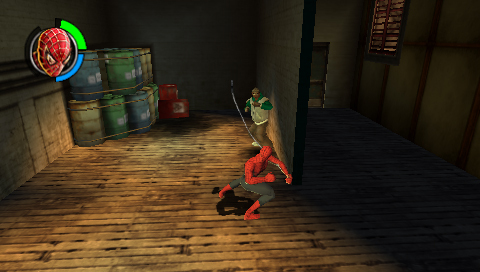 Spider-Man (2002) fixed its camera issues somewhat by allowing the player to manipulate the camera with a second analog stick, but this is something the PSP in every one of its incarnations lacked. The only way to manipulate the camera is via the directional buttons, leading to you having to stop while crawling on walls to readjust yourself or while off-screen enemies are shooting at you. An easy to initiate lock-on mechanic helps, but it’s never ideal. Where the lock-on works best is in the boss fights where focusing on one bad guy at a time is much easier than trying to jump between three or more nameless goons. I wouldn’t go as far to say as this version of Spider-Man 2 has memorable boss fights, but they’re pretty fun diversions. One standout is having to deal with Rhino and Shocker together as a tag-team duo because it bucks the usual, make Rhino run into a wall and then attack trend of nearly every other Spider-Man video game, though that is also present here as well. Perhaps the only case where the game’s camera faults rear their head is in the only fight with Doctor Octopus where you have to not only dodge the villain and a giant deadly orb of energy, but do so while trying to destroy eight generators. These rather simple objectives are made unneccessarily difficult by having to act fast and not being able to get a good read of your surroundings. The exterior levels fare much better as you’ll spend most of your time in the air swinging on webs and it’s much easier to course correct yourself without camera manipulation in these uncramped areas. 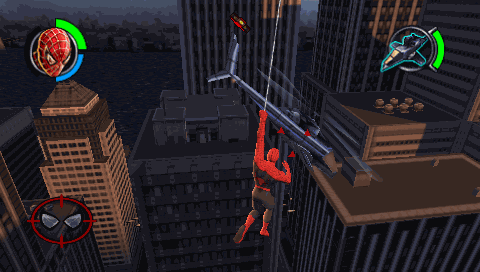 You’re not beholden to two swings before having to land on a roof top like the PSOne titles thankfully, instead you’ll participate in chases with the likes of Doc Ock and the Vulture where you’ll have to periodically land in order to defuse a bomb or repair a damaged billboard and water towers. 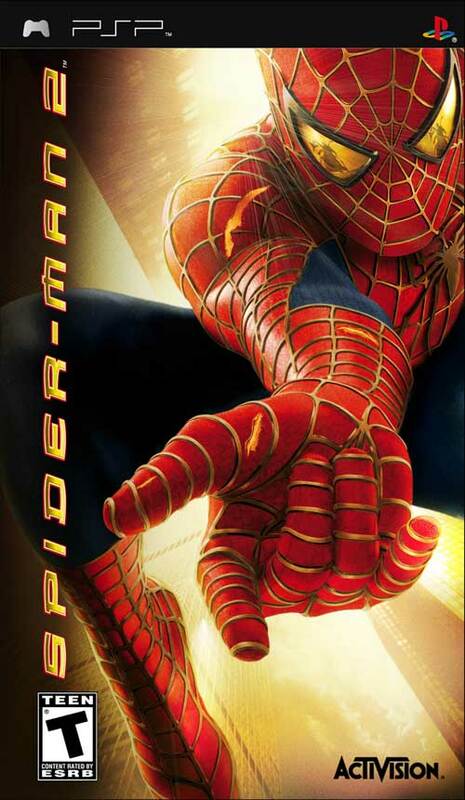 The swinging is serviceable, but it suffers from the same issue as Spider-Man (2002) where the physics are really awkward. For one Spider-Man is attaching his web line to absolutely nothing and then just weirdly stopping mid-air between swings like he’s skipping. These flaws were easy to look past in a pre-Spider-Man 2 world where it was mind-blowing just to be able to swing around the tops of skyscrapers, but somewhat hard to go back to. While it may be hard for some to go back to the linear days of past 3-D Spider-Man games after seeing what developers could do with the character after Spider-Man 2 on consoles, those who are looking for a good portable Spider-Man game on the go could do a lot worse than Spider-Man 2 on PSP. Not being able to adjust the camera while moving is problematic and the web-swinging fails to impress like it once did, but these comprises are understandable given the limitations of the platform and the type of game that’s best for on the go play. There’s a lot of great handheld Spider-Man games, but very few of them are fully 3-D, which makes a game like Spider-Man 2 on the PSP special, issues and all.